The 20th Annual Chicago Artists Month highlights the work of hundreds of artists throughout Chicago with performances, exhibitions, open studios, tours and neighborhood art walks. October 1 – November 15, 2015, #ChiArtistsMonth (CAM) will invite residents and visitors to meet artists and see their work at venues across Chicago. As the world comes to Chicago to discuss the state of architecture, the CAM 2015 theme The City as Studio looks at Chicago as a place for investigation, experimentation, innovation and production, and encourages a dialogue with the inaugural Chicago Architecture Biennial opening in October. 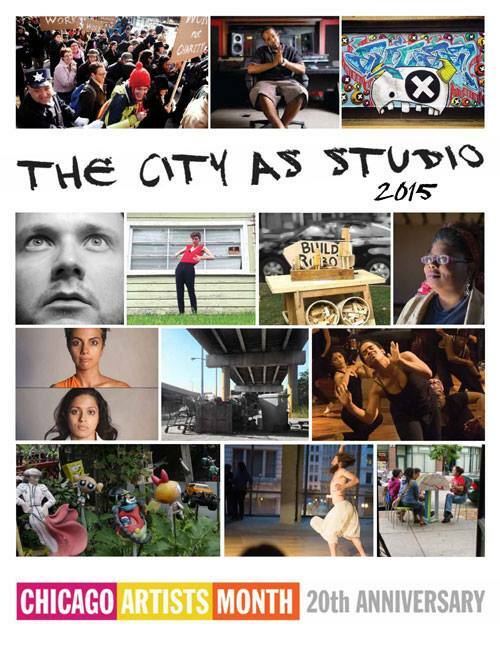 Meet artists, see their work and make your own at 300+ events across the city. Cocomocha is proud to join the festivities with our #DriveByArt event, installations, and interactive #hashtag-it-up art walks. Click the Events Calendar for details. #ChiArtistsMonth 2015 is presented by the Chicago Department of Cultural Affairs and Special Events, in collaboration with the Chicago Park District and the Chicago Public Library. In-Kind support from Lettuce Entertain You Enterprises,®Inc. Cocomocha Studio, in collaboration with Chicago local artists, is preparing to head to the streets of Chicago's Southeast Side on Sunday, April 26th to tag the streets with art. It's our ongoing effort to stand up against violence, to support our community and to spread positivity. The #driveby initiative has already made it's way around the area, decorating rows of trees along the sidewalks. As artists prepare to add finishing touches, come join us for our kickoff event at Mana Contemporary 2233 S. Throop St. Chicago, on Friday April 24th from 6:30pm-9pm. Meet the artists, have a sneak peak at the art, enjoy some wine and treats, and support our cause.